Hi friends! I hope you're having a great day! I'm blogging over at the Love My Tapes Blog and I wanted to share my project with you. I love using lace tape for vintage cards! It's so easy to use, you can put it on card even after you glue the layers down because it's tape and doesn't need to be tucked under like ribbon. 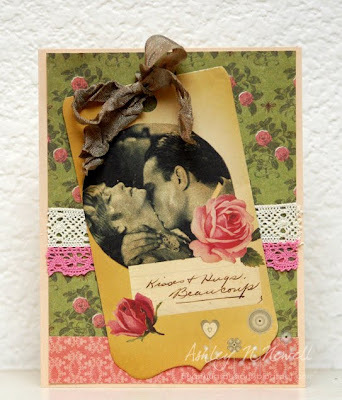 I used a cream lace tape and dark pink lace tape for this card. I used some Cosmo Cricket Evangline papers and tag on this card. I added some seam binding to the tag.